If you’re a forklift driver, or interested in becoming one, you’ve probably heard the term material handling. It’s one of the most talked-about subjects in the logistics industry. This is because most companies can save money and raise profits with a good material handling system in place. Material handling is just like it sounds. It’s the secure transfer, storage, and cargo management across the entire continuum of the supply chain. This includes manufacturers, distributors, end consumers, and more. How important is material handling to the business cycle? Consider just one example. For a manufacturer of heavy equipment and machinery, the cost of excess storage for expensive materials could exceed millions of dollars in just a few weeks. If suppliers, builders, or end users aren’t able to access or use this equipment, it has to be stored somewhere. That’s typically at a big expense! The entire material handling process involves dedicated personnel working as an extended team, often across hundreds or thousands of miles. In today’s global economy, with supply chains stretched across multiple countries or continents, the single parts of the material handling process are each important in their own way. All forklift drivers are material handlers. Forklift drivers are key to the timely delivery, shipment and storage of cargo and material. Without forklift drivers, pallet jack operators, and other powered industrial truck employees, it’s safe to say that material handling would never even get off the ground, or at least leave the shipping facility. The material handling process starts with careful pre-planning. This involves proper forecasting and anticipating how the supply chain will impact cargo shipment, distribution, and final delivery. Many companies now use Kanban-style scheduling systems to optimize material handling. This method aims to achieve a so-called “lean” supply chain management, where products and personnel are used on an as-needed basis. Even when trying to reduce waste and optimize resources, it’s very difficult to totally get rid of every system flaw. This is especially true during the next part of the material handling process: inventory management and supply chain optimization. 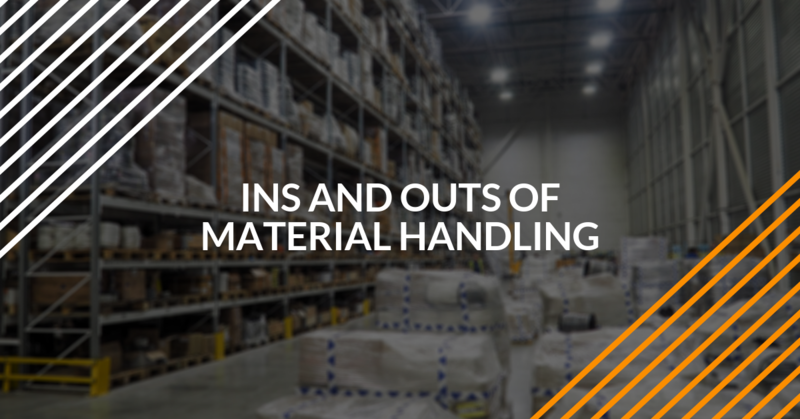 The ability of warehouses, retailers, distribution centers, terminals and other links in the supply chain to quickly store, sort, and ship products is what keeps the material handling system running. The smallest problem during this part of material handling creates the ultimate negative domino effect that’s felt through the whole supply chain. This could include things like a warehouse power outage, a broken-down forklift, or interstate highway accident. During this part of the dynamic material handling process, forklift drivers are a critical component for timely delivery and optimal revenue. This leads to satisfied customers, suppliers, and consumers. Final delivery is often considered as the final step in material handling. This part is closer to the end, but not quite there. During final delivery, all the hard work that went into pre-planning and inventory management finally pays off. During final delivery, the products that started the whole material handling course finally arrive at the end destination. This could be a retail facility, construction site, or even another warehouse (if the material handling procedure involves long-term storage). We’ve finally arrived at the last stop in the material handling chain: post-sale support and service. In order to keep customers and promote a positive, customer-first culture, many companies follow up their delivered products and services with upsell opportunities like warranties, installation assistance, or additional products. Ironically enough, this will start the entire supply chain/material handling activity all over again! Material handling is certainly a team effort, but are there more valuable team members than forklift drivers? Lift operators, pallet jack drivers, and others are often expected to do much, all while performing to the latest OSHA workplace standards. This can be a tough balancing act, especially if you don’t have the proper foundation of knowledge and skills. That’s where we can help with your material handling training needs. Our three courses help anyone get up to speed with OSHA safety guidelines. With affordable, easily accessible training courses your employees can take from anywhere, ForkliftCertification.com is simply the smartest option for achieving OSHA compliance. Training Kit – this popular course provides a solid baseline understanding of the proper and safe way to operate any forklift. Train a Trainer – to get your company’s own on-site Certified Forklift Safety Expert, choose this helpful course! It’s popular with safety supervisors, forklift drivers, and more all over the United States. Bundle Package – get our Training Kit and Train a Trainer packages at a special discounted rate! Material handling is tough enough – especially if you can’t handle your own training needs or OSHA compliance requirements. Let us do the heavy lifting for you and your employees. Contact us today and get started. If you have any questions about how our training can benefit your facility or material handling process, call (888) 278-8896.